Water is the breath of life. The WellSprings property is blessed with an abundance of water sources, each unique in their healing qualities and features. Water is a community resource and, as such, water is meant to be shared, and experienced. The benefits of hot water soaking are realized immediately. The body recognizes good water in the same manner that the heart recognizes an old friend. Eighty thousand gallons of warm, artesian water surface at a temperature of 103 degrees Fahrenheit. Warm water supports relaxation by stimulating the parasympathetic nervous system and quieting the sympathetic, “fight or flight” nervous system. With a pH of 9.4, the water is naturally alkaline. Modern science confirms what First Nation tribes and early settlers affirmed over time, namely, the value of alkaline water in promoting health and vitality. The high pH – together with its sulfur content, are responsible for the water’s bacteriostatic and bactericidal properties. Studies demonstrating the water’s antibiotic component have allowed WellSprings to deliver non-chlorinated water into our swimming pools. The water is soft and silky to the skin and hair, largely the result of its high carbonate and phosphate, and low silica contents. The water is rich with gold and the monoatomic aurum, adding to its energetic qualities. Unlike the cool springs that feeds Lithia Park, WellSprings water contains only a small amount of lithium. Our drinking water delivers water from a large, underground, warm water aquifer at a temperature of 78 degrees Fahrenheit. Non-chlorinated drinking water to the spa, office, and café is filtered to reduce its sulfur content and odor. The steam room is supplied by cool water springs, located on the hillsides overlooking the WellSprings. This water is delicious and robust and, when atomized, delivers a gentle and refreshing mist to the sinuses and bronchial tree. The spring-fed, warm water Mikvah flows into Wildcat Gulch which meanders through the entire property and separates a grassy, park-like setting from the forested hillside. 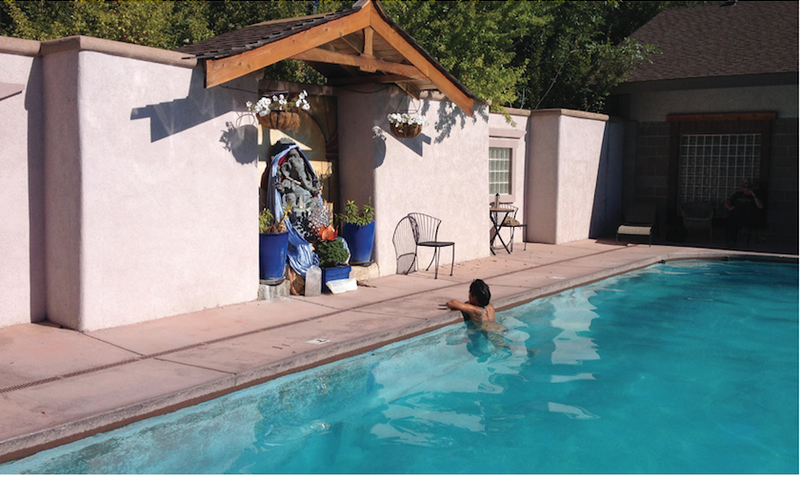 The Mikvah is an ancient tradition of ritualistic cleansing and healing, through immersion. Generally a tradition enjoyed by Jewish women, WellSprings’ Mikvah invites the entire community to participate in spiritual renewal, through immersion in holy water. The sacred pool has been visited by rabbis from Israel and New York, First Nation community, Russian and Greek Orthodox, Unity and Unitarian, and by Christian, Buddhist, Hindu, Muslim and Essene leaders. Irrigation of the grounds and gardens is performed from a variety of water sources, including the cool, hillside springs, Wildcat Gulch, and water intercepted from the swimming pools as a means of cooling the water before entering Bear Creek. 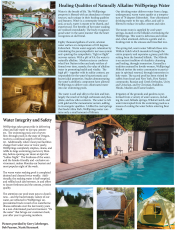 WellSprings takes great pride in delivering clean and safe water to our spa customers. The swimming pool, one of seven flow-through pools in the state of Oregon, receives a continual supply of fresh water. Additionally, where most pool facilities change their water once or twice yearly, WellSprings completely empties, cleans, and refills its large swimming pool every Monday, before opening our doors at 6pm for “Ladies Night.” The freshness of the water, and the female-friendly and -exclusive environment, makes Monday our busiest and most popular night of the week. The warm water soaking pool is completed drained and cleaned twice weekly. Additionally, the soaking water is half-emptied, and refilled each day between, in and effort to insure freshness and the utmost, pristine quality. The attention our pool team pays to cleanliness – and the bacteriostatic nature of our water, are reflected in WellSprings’ unprecedented track record of no waterborne illness outbreaks over the last twenty years in a non-chlorinated pool environment. “It’s the water” that brings our customers back, year after year in growing numbers. Jackson WellSprings was one of several springs located near Ashland at the turn of the last century that contributed to the city’s reputation and economy as a center for health and rejuvenation. Thousands traveled to Ashland each year to “partake of the water.” One hundred years later, the same flow-through swimming pool serves southern Oregonians and travelers up and down the I-5 corridor. Eighty thousand gallons of naturally alkaline mineral water bubbles up for the earth’s core. Situated in an oasis garden setting, the spa facility is equipped with an Olympic-size swimming pool, warm water soaking pool, two private Jacuzzi tubs, steam room, and sauna. Revitalizing massage and warm water therapies, along with organic herb and vegetable gardens, complete the prescription for health and vitality. WellSprings is a mobile home and RV park village of 100 people. With tent campers, workshop attendees, and those renting tiny homes, teepees, and glamping (glamorous camping), our summer population swells to 200 people. We have a newly remodeled patio and fountain area that welcome daily, monthly, and annual pool guests to our recently remodeled office and café and newly remodeled locker rooms. We offer clothing optional bathing from 8 pm until midnight, a feature that has contributed to WellSprings’ growth and popularity. Team WellSprings is comprised of farmers, permaculturists, students, artists, designers, dreamers, and builders. Our dedicated staff has been working diligently over the years to improve WellSprings’ outdated infrastructure so that the services we offer – massage and Watsu, camping and glamping, classes and workshops, organic gardens and meals – are available to more people. Dedicated to optimal human and environmental health, WellSprings is home to the Health Research Institute, a nonprofit educational organization that sponsors water and land-based restoration projects such as the hortus medicus (medicinal herb) gardens and vegetable gardens that are situated in the Sacred Meadow, alongside the Ashland Goddess Temple and the newly evolving Temple of the Oaks men’s temple. In partnership with the Health Research Institute, WellSprings’ focus has been one of education, beautification, research, and implementing health-promoting principles and practices of healing, ceremony, environmental restoration, and gathering. Both organizations are committed to keeping prices affordable for the benefit of healing Southern Oregonians and travellers, alike. With every year, an increasing number of members are incorporating WellSprings into their daily routine, on the way to or from work or at the end of the day. WellSprings recognizes the value of gathering, music and dance in unifying the hearts and spirit of our extended community. After a decade of productions, WellSprings is becoming an increasingly popular venue for west coast music and a new paradigm of cultural events. WellSprings is a diverse events center with three unique venues, ranging from the 1,600 square foot Community Room where weekend workshops and on-going yoga, dance and kirtan are conducted; the 3,000 square foot Casbah open-air pavillion; and the outdoor Seamana stage, home to several larger summer festivals. 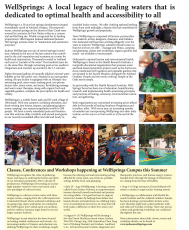 WellSprings’ recent attention has been focused on healing-related conferences and retreats. 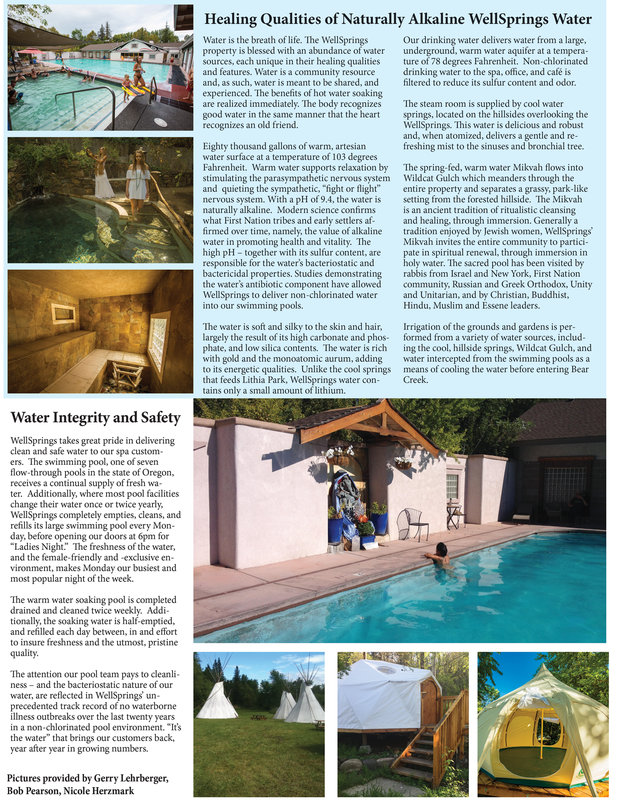 An increasing number of trainers and educators are utilizing WellSprings for their workshops, largely because the relaxing and and rejuvenating setting afforded by warm water, sun, fresh air, parklike setting, healthy food, and glamping. • (July 28 – Aug 4)WellSprings is hosting a retreat called Social Artistry Odyssey, an empowerment journey directed towards motivated and passionate young adults. Our goal has been to support tomorrow’s leaders by helping them define and launch dreams and aspirations on a lifelong trajectory of commitment and service in areas that will truly make a difference in their lives and in our world. • (August 9-13) WellSprings will be hosting a five-day Daoist Medicine retreat where Lindsey Wei (Wei Cheng Ling, 24th Generation Chun Yang Sect of Wudang Daoism) and Graham Lankford, L.Ac. will unveil ancient wisdom, diagnostic and therapeutic practices, and human energy systems, handed down through the lineage of Daoist healers, dating from the time of Buddha. • (Aug 4 -6) Yoga instructor, Krista Holland will return a conduct a yoga teacher training retreat. • WellSprings, in collaboration with Health Research Institute and the Ashland Goddess Temple, has been hosting a permaculture lecture series each Thursday night and a plant medicine walk-and-talk each Tuesday evening. Three-day permaculture and gardening workshops are conducted throughout the year.